Acceptance, technology and marketing combine to make solar-powered devices extremely viable and available for so many applications and the PulseTech Solar Pulse SP-5 is one of these. From a functional perspective it is self sustaining, costs virtually nothing to maintain and provides an essential maintenance function. It is worth a hard look for what it is, what it can do, the potential benefits for the environment and for what should be an excellent return on investment. As consumers, we have many choices regarding battery chargers and in recent years both technology and demand have resulted in “smart” chargers nearly dominating the market. Most of these “smart” chargers are quite sophisticated, with multi-mode functionality and multi-step processes to monitor and care for a battery, therefore making sure it has a long lifetime. One of the most well known players in this industry is PulseTech Products Corporation (PulseTech), which provides battery maintenance technology for motorcyclists, car owners, fleet owners, truckers and the military. The company offers over 60 different battery charging and maintenance systems, a range which should cover just about every battery type available. 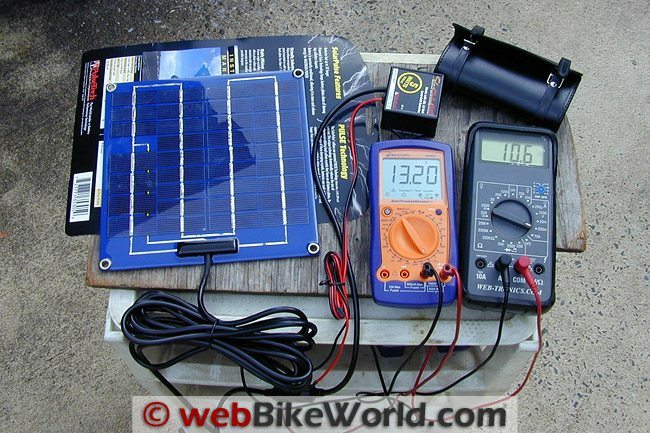 One of those PulseTech products is the Xtreme Charge Motorcycle Battery Charger (review) that was reviewed by Burn on webBikeWorld in 2007. And I recently reviewed the PulseTech Xtreme Battery Tester (review). The PulseTech Solar Pulse solar battery charger is another product developed by the company for remote battery charging and maintenance. The Solar Pulse SP5 solar battery charger uses what PulseTech calls its “ReNew-IT” technology, claimed to prevent the main cause of battery problems and failure — sulphation build-up on lead-acid battery plates. It accomplishes this by sending a pulsating DC current into the battery. The current also helps in removing existing sulphate deposits from the plates. The company claims that the technology has been used by consumers and the U.S. military for over ten years. Without getting into the multi-faceted issues surrounding solar energy, I simply see it as a source of clean and quiet energy, to be appreciated and leveraged. Solar-based products have become a large part of various energy supply sectors and for good reason: where access to a public or private power grid is limited or non-existent, solar powered devices can literally save the day. 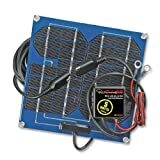 PulseTech’s Solar Pulse line of solar battery chargers includes a 2-Watt version (the SP-2); the 5-Watt SP-5 that is the subject of this evaluation and a 6-Watt, 12 Volt version designed for mounting on the light bar of emergency vehicles. The main differences between the three chargers are the output and panel size and shape. The SP-5 solar charger is relatively compact and it includes the PulseTech “ReNew-IT” Pulse Technology, along with what is claimed to be “an exceptional charging system”. The device is very simple, with only two connections, one status light and no controls. The PulseTech Solar Pulse chargers are claimed to work with every type of lead-acid battery, including flooded cell, AGM and gel. With some of the same technology found in their more complex battery chargers, PulseTech claims that the SP-5 has the ability to clean damaging lead-sulphates from the battery plates, which helps maintain a battery that can accept, store and release its power when needed. The main benefit of the de-sulphating process is that it can help prevent the loss of battery power on vehicles that are stored for months at a time. 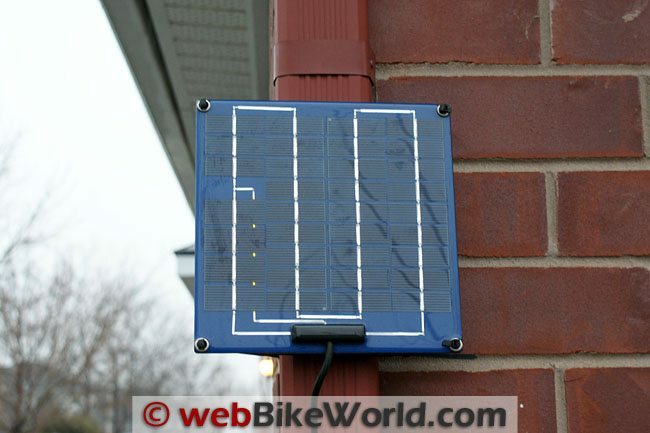 Another listed strength of the Solar Pulse charger is its maintenance functions, which are designed to partially or completely offset energy-robbing or “parasitic” loads on the battery that are a result of modern motorcycle electronic technology. This includes features like motorcycle alarm systems, LCD panels, electricity needed for computers and others that constantly drain small amounts of power from the motorcycle battery. All modern vehicles experience some parasitic loss from the battery and motorcycles are not immune to this issue, especially as owners fit more and more devices to their bikes. Some of these devices are integrated with the vehicle power harness and others may be wired up as an external load. In any event, over the course of time, when vehicle sit for extended periods of time without being run the daily and ultimately cumulative drain is quite significant. This is one of the most important reasons to have an ongoing battery or electrical maintenance program in place. Based on its output and with regular use, the SP-5 is claimed to completely offset typical daily or cumulative loads. This makes it ideal as a stand-alone or fix-and-forget maintenance system, especially where an external power source for a traditional battery maintenance charger may not be available, like in a remote shed, garage or other parking place. It is well proven that a regularly maintained battery is typically a long lasting one, that won’t disappoint when spring arrives. The SP-5 system consists of three components: the solar panel with a three-pin quick disconnect plug; a circuit or control box that houses the ReNew-IT Pulse Technology circuitry; and a connection harness that runs from the circuit box to the battery. The battery harness is actually two sections that are joined together by a standard SAE DC connector so that the battery terminal section can be more or less permanently installed and the system disconnected as needed. The flat weatherproof solar panel measures 8.875 x 8.75 x 0.125 in and weighs just over two pounds, including the control box and cables. PulseTech claims that the SP-5 is almost half the size of other five Watt panels and based on other solar products looked at the claim seems valid. With some prolonged fall weather now giving way to some early winter, riding time is becoming more limited, as are sunlight hours, a factor in getting in the Solar Pulse up and running. For optimal exposure to the sun during the fall and winter, I mounted the panel at the seven foot level on the south-west facing wall of the garage using a conveniently placed gutter downpipe (see photo below). I put two strips of adhesive-backed weather stripping on the back of the panel to keep it from sliding on the metal and to provide some cushion. Each corner of the panel has a grommet-reinforced hole, so mounting the panel using two long cable ties looped around the back of the downpipe was not a major effort. The solar panel to circuit box cable is 17 feet in length, long enough to let me run it about six feet into the garage along the outer wall. I temporarily mounted the circuit box on a convenient wall support, which keeps it out of the way while still letting me see the small red LED indicator mounted on top of the circuit box. For initialization purposes, the F800GS closest to the circuit box became the recipient for the two-piece 36 inch long battery harness. When I want to connect the system it’s a simple matter to join the two sections together using the SAE connector. I am also making a longer 10 foot SAE DC harness that will provide more flexibility (reach) when using the solar charger. When the circuit box is activated by connecting the battery to the system, the small red LED will glow faintly, indicating that a circuit has been made (see photo below). Once the panel starts collecting and energy is sent to the circuit box, the LED glows brighter or pulses — sometimes slowly and sometimes very fast. The system seems simple and this fact was basically confirmed after some email correspondence with a company representative. What I now know is that with a low amperage output of 350mA no charging regulation is needed per se and that the solar panel provides two outputs. A small portion of the panel generates the energy for the circuit box originated pulse that conditions the battery, while the remainder of the panel generates the actual charging current. For indication purposes, the single red LED stays on in full sunlight, but blinks in partial sunlight to show that the system is still working, but not at full efficiency. This information explains the varying blink rates I have observed, so now you know. I was also curious about what, if any affect, the pulsating DC current might have on other electronics. This is actually addressed in the warranty and warnings section of the SP-5 Manual — it clearly states that the pulsating DC current might interfere with some electronic devices if the circuit box is placed near a related device antenna. As installed, output from the solar panel is pretty constant most of the day, even when the sun is partially obscured. The system is obviously doing its job in charging the connected battery and hopefully, as claimed, addressing the issue of lead-sulphate deposits on the battery plates. Using the PulseTech Xtreme Charge Battery and Alternator Tester and a more sophisticated multimeter , both of the F800GS batteries, originally at 50 and 75 percent earlier in the week (one had been run down on purpose), are now back at 100 percent after two days of solar-based maintenance per machine. Another pending task for the system will be to maintain a much ignored battery residing in the 1976 Suzuki GT750A. The CTEK Multi US 3300 (review pending) is currently working, seemingly successfully, on reviving that battery. The ability to revive aging and neglected batteries is a capability of smart chargers that I can live with, but for longer-term low-key maintenance purposes the quiet and efficient Solar Pulse SP-5 addresses requirements nicely and best of all it generates energy instead of consuming it. 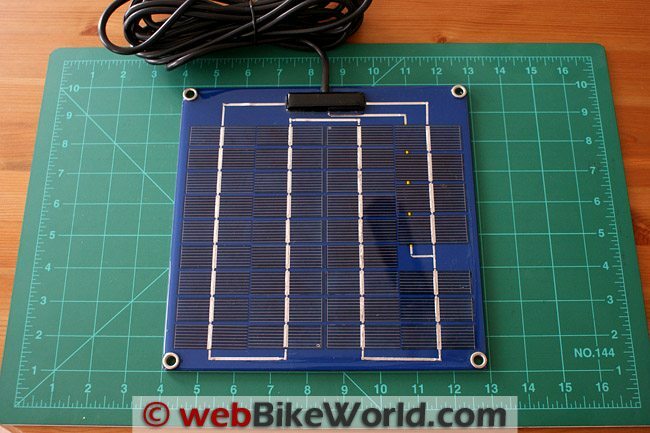 Solar Panel: Polyurethane encapsulated panel on aluminum backing. Single-crystalline silicon photo-voltaic cells. The Solar Pulse SP-5 is by appearances a pretty basic and pretty simple device. It takes little effort to get it up and running and has a myriad of uses: static, mobile, near or far, with portability that is hard to beat. While not yet fully understanding all the technology used in smart chargers or even simpler devices like the Solar Pulse SP-5, I can appreciate what this type of device provides — clean quiet energy and the ability to extend, greatly in some circumstances, the life cycle of a battery; all good. For my purposes the SP-5 is a great addition to the current list of chargers in use and as long as the sun is shining and there is something that it can charge, it will be used. Review Date: December 2010 Warranty: Five year limited warranty. I would regard the question as relevant if the device in question was a strict “Power Output Device” used a replacement for nasty old coal fired grid power, but there’s more to the device than just its use as a “power output device”. The intent and cost vs. “real value” doesn’t just equate to energy saved over a regular battery charger. The device is meant to save typical lead acid batteries and extend their life. To get to the value vs. cost you’d need to factor in the savings to the environment of not replacing a lead acid battery that didn’t use the device. If it’s expected to last 20 years, then how many years of lead battery life does it extend? If it meant one or even two less lead batteries having to be made and sold and discarded, then that would be the true value vs. cost to use for measuring this device. I believe the manufacturer did a nice job of justifying the device by energy potential output over it’s life vs. what it cost to produce energy-wise, but what is the device’s true use? Not producing energy in and of itself but extending the life of other high use costly batteries. Just a thought in the considerations for justifying the device. From “J.C.” (12/10): “I just read your review of this product. As an environmentalist, as well as an avid motorcyclist, I would like to know what the life expectancy of the solar collector is, how much overall energy is consumed gathering the materials and in the manufacture of the panel, and whether the total electrical energy output of the device over its lifetime is greater or less than the energy costs in producing the device. Editor’s Reply: Good question and one that should be answered for other products using these technologies, such as electric vehicles, which use the “Zero Emissions” label, a marketing fantasy. I’ll email the company to ask if they have done anything like an environmental impact equivalent analysis on the product. “You’re correct, we don’t have those numbers. Numbers like these are great to have and usually come from companies much larger than ours with big research and marketing budgets, etc., but we can give you some estimated numbers on the plus side to weigh against the energy to manufacture costs….. Assuming a proven life span of 20 years for the solar panel and circuit board and a 5% regression over the 20 years we can estimate the following: Average 8 hours per day of solar input. This will provide 58,400 hours of input. Assuming a full 5 Watts, the yield would be 292 kilowatts over 20 years. At 15 cents per watt estimated the total value of this power would be $43.80. I am just guessing, but I would place a cost to manufacture in energy expended at about 20 kilowatts(including the silicon, plastic resins, wire, paper and metals), which leaves a net savings to the environment of 272 kilowatts. This is assuming the materials are mined and processed in large batches. You could argue that there will be cloudy days and conditions that will restrict the solar input, but there are going to be days when there are 12 or 14 hours of input, not 8. There is also the rational estimate that a kilowatt will cost much more than 15 cents in the next 20 years, so I think this is not too far off base.